Dennis Aman (SF), Paul Erlich (MA) and Jonathan Glasier (SD) are 3 of the most active torchbearers composing and performing in the small equal divisions of the octave first popularized by Ivor Darreg who would have turned 100 May 5 2017. 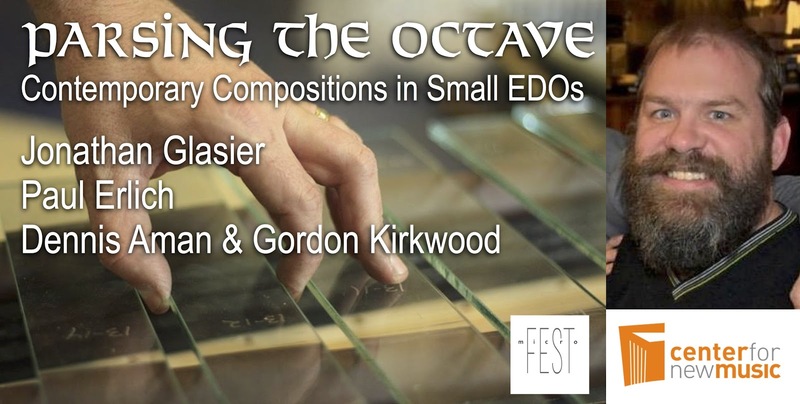 Dennis Aman and Gordon Kirkwood will perform two recent works that include audible soap bubbles, and a replica of the world’s first drum machine that compare and contrast different non-12 equal temperaments tuning systems. This performance coincides with Aman’s exhibition “Parsing the Octave” on display at the Window Gallery for Invented Instruments, at the front of the Center for New Music, where the public can play instruments in unusual equal temperaments and compare intervals. Dennis Aman, a native of the San Francisco Bay Area, studied Electronic Music at San Francisco State with Richard Festinger and Composition privately with Dan Becker. He was a chorister with the San Francisco Symphony Chorus, and is currently a member of the Cornelius Cardew Choir. His compositions have been performed in Lithuania, Ukraine, Japan and most recently at the “Eclectic Salon” at Villa Aurora in Los Angeles. In addition to writing and performing, Aman is a producer and co-host of “Music From Other Minds,” a weekly new music radio show on KALW 91.7 FM in San Francisco. He is passionate about modifying and building new acoustic instruments. Aman is currently completing a commission for Electric Guitar and Percussion duo, “The Living Earth Show.” This extended work consists of 24 Preludes and Fugues in Equal Divisions of the Octave [1 through 24], as well as the building of microtonal instruments required to realize the piece.